Why do I pick up your slack? I apologize for the lack of new posts but I’ve been under the weather for the last week or so and it caught up to me in the last few. To give myself a little bit if a needed break I decided to refrain from partaking in any kind of photo taking or blogging until I felt in the right state to do it and this is my way of testing the water a little bit. I have a little bit of time before any new commitments blogging wise come up so I decided to try my hand at something I usually reserve for Halloween, which is do photographs inspired by The Crow. I’ve loosely associated this photo with the second film in the series, City of Angels and while nothing will ever come close to the originals I enjoyed it as best as I could because I wasn’t expecting anything so I wasn’t disappointed. 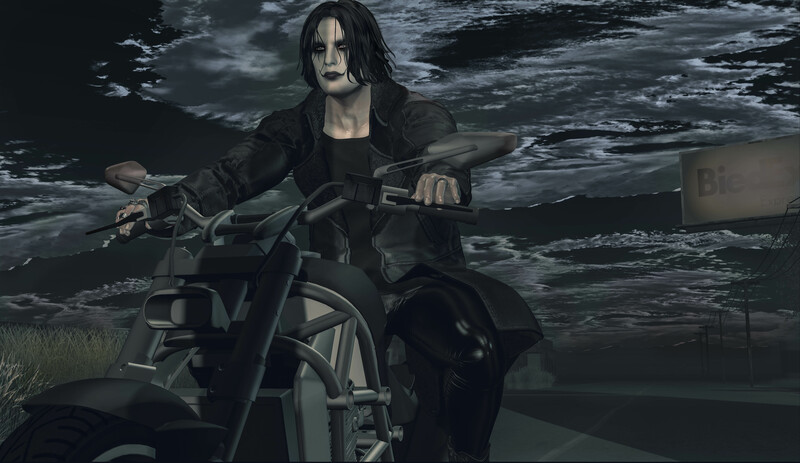 The version of the the character, Ash, was a mechanic who rides a motorcycle in the film so this is my tribute to it but not as closely based as my previous photos related to the original film. Everything I used for this photo are non-current event items that I pulled together however there is a new release that is store specific in the form of the “Leather Leggings” that I am wearing from NOCHE. That’s right, I couldn’t pass these up because I am a fan of things that are made of leather…(wallets, jackets, shoes and of course pants or leggings as these are). There is also a latex version that came out at the same time if you’re more into that than leather which is alright too. But you can get your leggings fix on by going to the main store and checking these out. Sometimes putting photos together can be difficult as far as poses go. Trying to find the right thing to make the setting perfect so while I was trying to find the perfect motorcycle prop and pose set, I ended up combining the bike from WetCat’s recent “Young Blood” couples pose with Poseidon Poses “Action Bike” pose set (took them out of the bike and threw the pose I wanted into a poseball). Combining them worked out for me because it gave me the look I wanted from the start; sometimes improvising is the best answer to getting the results I’m looking for. I love long coats (duster’s and trenches or anything in that family) and through a photo I saw on Facebook, I was introduced to one I’d never seen before by Lenox. It surprised me because I’m usually pretty good at keeping up with releases from the store with many of them residing in my closet already. I made a run for the store and instantly grabbed all of them because who knows when I may need this in another color down the road (pun intended of course). The fit is great and it also has materials to give it an extra special look with advanced lighting much like the leggings I paired it with. On that note though I think I am going to leave you all with the credits and at least say that if anyone might be interested in the face pain I have on it is one that’s been retired for quite a while so it’s something that unfortunately cannot be purchased. Hopefully though someone will come along and and perhaps make an newer version that could be even better. I am going to go find some more things to bundle up with and be back again soon providing I don’t freeze to death in the great freezover of 2019. Hope you’ve enjoy my brief little post and I look forward to getting back more into the swing of things in the next few days as February is now upon us. Until then be will, stay safe and treat others as you’d like being treated.